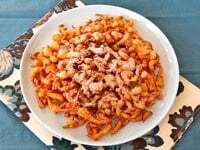 Learn the history of funnel cake, from medieval Anglo-Norman times to present, and try a tasty traditional Pennsylvania Dutch recipe from 1916. As the seasonal weather warms and summer approaches, Americans get an itch to celebrate. Sunny days provide the perfect excuse to host outdoor fairs and festivals. These country-inspired events send us into fits of reckless abandon when it comes to nutrition… smoked turkey legs, barbecue beef sandwiches, roasted corn with melting butter, popcorn, cotton candy, ice cream and pie, French fries, fried chicken, fried Oreos… the list goes on. Fair food is pure sugary, salty goodness, and an awful lot of it ends up deep fried. It seems fitting, then, that the queen of fair desserts is also fried—the crispy, crunchy, melt-in-your-mouth treat known as the funnel cake. Take þere þridde part of sowre Dokkes and flour þerto. & bete it togeder tyl it be as towh as eny lyme. cast þerto salt. & do it in a disshe holke in þe bothom, and let it out wiþ þy finger queynchche in a chowfer wiþ oile. & frye it wel. and whan it is ynowhz: take it out and cast þerto suger &c.
In medieval times, the fritters were most often made by pouring a yeast or sourdough batter through a bowl with a small hole cut in the bottom. The resulting cakes were doused with sugar syrup and sprinkled with salt. This salty sweet combination actually seems a bit more modern than the simple dusting of powdered sugar we’ve grown accustomed to. 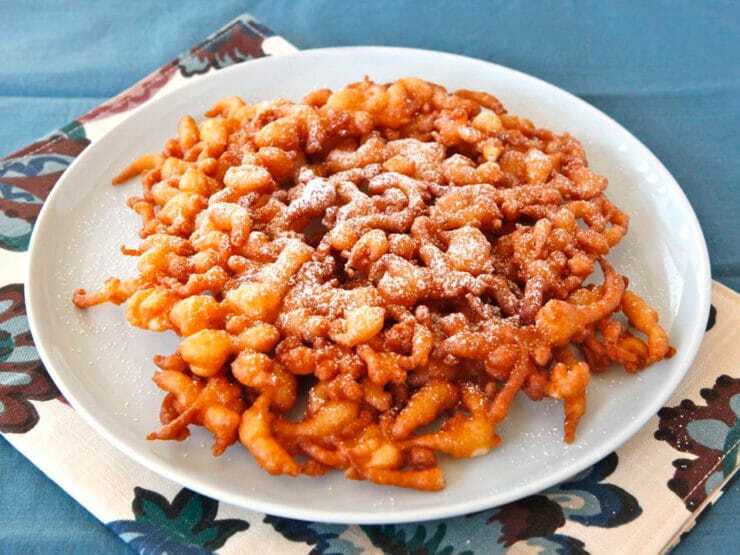 In modern day America, we’ve come to associate funnel cakes with the Pennsylvania Dutch, a group of mostly German speaking immigrants who came to Pennsylvania during the 17th and 18th centuries. The “Dutch” part of Pennsylvania Dutch is thought to have come from the German word “Deutsch.” Much of the food lore surrounding the Pennsylvania Dutch has been exaggerated over the years, the majority of it having no real roots in their traditional cuisine. If the subject interests you, I recommend As American as Shoofly Pie, a well-researched book about the food of the Pennsylvania Dutch by William Woys Weaver. The University of Pennsylvania Press sent me an advance copy a few months ago, and I really enjoyed learning more about the food lore (and “fake” lore) of the Pennsylvania Dutch. I was particularly struck by a chapter on the Kutztown Folk Festival, which discusses the regional roots of the funnel cake. 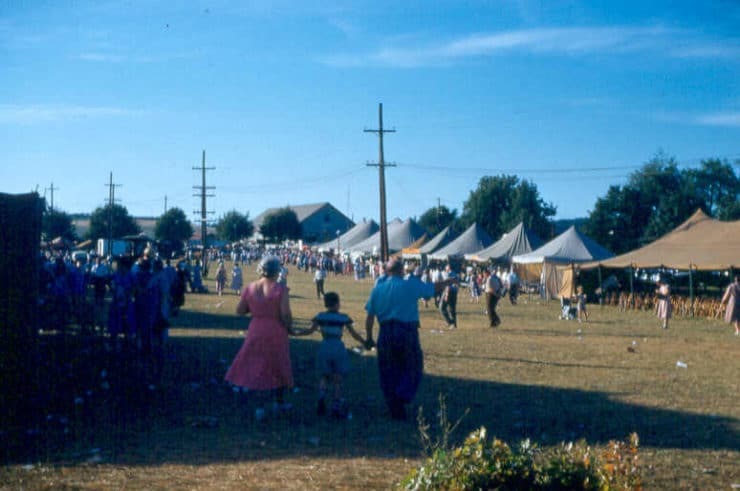 The Kutztown Folk Festival originated in 1950, when a group of professors set out to create the Pennsylvania Dutch Folklore Center at Franklin and Marshall College in Lancaster, Pennsylvania. The festival helped to promote a growing national interest in Pennsylvania Dutch culture, while also providing an opportunity to raise funds for the folklore center and future research. The festival was the first of its kind, in that it focused completely on one specific regional American culture. Every aspect of Pennsylvania Dutch life was covered, from food to religion, through storytelling and demonstrations. The festival proved to be a massive success; however, it also became a source of inaccurate information disseminated by over-excited journalists. In the midst of a festival that attracted nearly 100,000 people per year by 1960, it became easy to overlook the facts. Pennsylvania Dutch funnel cake mythology evolved in large part due to the Kutztown Folk Festival. Funnel cakes were served at the festival and became wildly popular as a result. A woman by the name of Grace Merkel Henninger recalled making the cakes for hungry festival-goers along with friends Stella Heinly and Emma Miller. Miller provided the recipe; she had been making funnel cakes for her family during the winter holidays. In the back of a concession stand, the four ladies deep fried the funnel cakes four at a time and sold them for 25 cents each. A price that low would be dangerously tempting nowadays! The cakes were a smashing success; during the festival, several thousand funnel cakes were sold. From that time forward, funnel cakes became a trademark dessert at every Pennsylvania Dutch festival that followed. 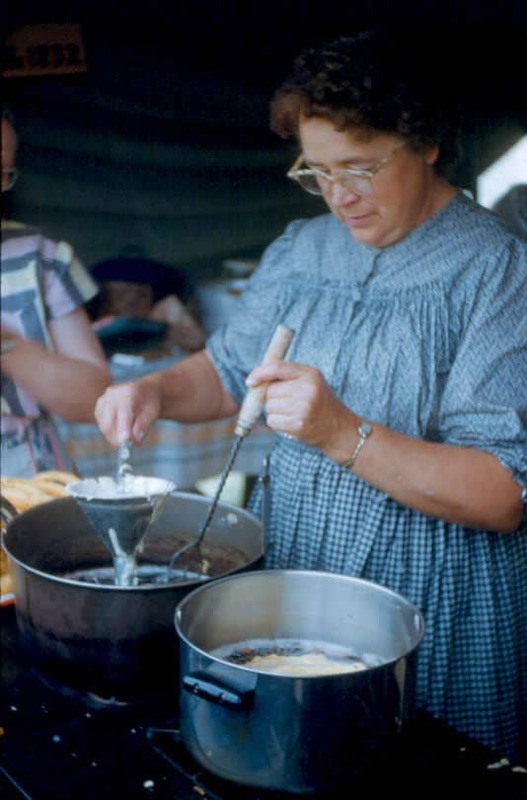 While the Kutztown Folk Festival brought these treats into the mainstream, funnel cakes were not typically identified as a Pennsylvania Dutch food prior to the festival. Examples of recipes can be found in a few regional cookbooks prior to 1950, but not many. I own a 1946 cookbook called The Pennylvania Dutch and their Cookery that makes no mention of funnel cakes. Before the 50’s, they were made occasionally as a winter holiday treat—not widely popular, but well known in certain family circles within the Pennsylvania Dutch community. It is clear that the cakes became more firmly rooted in Pennsylvania Dutch food lore thanks to the Kutztown festival. 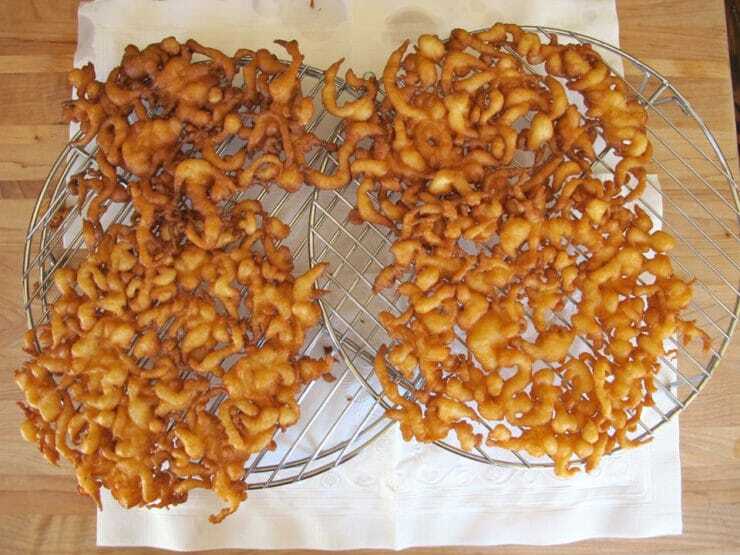 Funnel cakes were a nineteenth-century Christmas and New Year’s novelty sold at church bazaars and holiday markets. Like Fastnachts (Shrove Tuesday fat cakes), they were once expensive to make because fresh eggs were in short supply during the winter months and eggs stored in isinglass (the only way to preserve eggs during cold weather) were worthless for use in cakes. Thus pre-1940s Pennsylvania Dutch recipes for funnel cakes are relatively scarce. This particular recipe dates from 1916 and was used by Lizzie Brendle Weinhold (1884-1958), whose husband, John Dridge Weinhold, was a well-to-do cigar maker in Lancaster County. I’ve posted the recipe and step-by-step pictures below, so you can try making this classic festival treat in your own kitchen. The process is messy, so prepare to give your stovetop a good scrubbing after you’re done. The recipe produces quite a few cakes; feel free to halve it for a smaller batch. 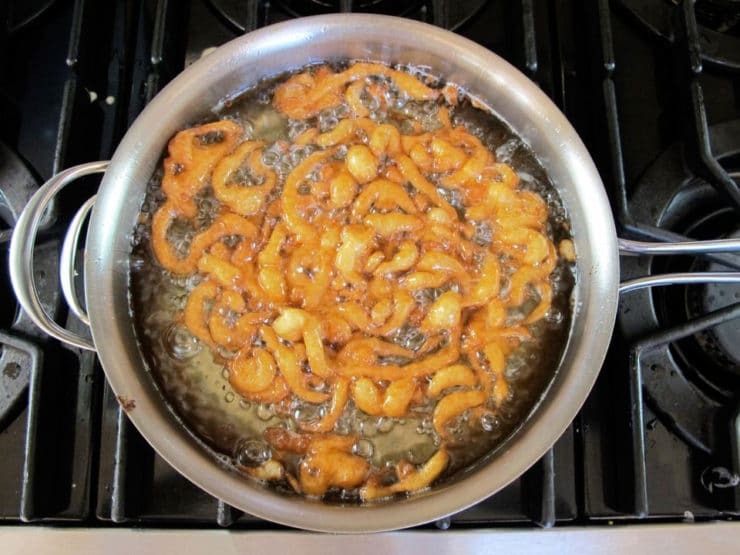 The cakes turned out crispy, golden, and wonderful—everything a funnel cake should be! The more widespread American name derived from the manner in which the batter was dropped into the oil though a funnel, which the Pennsylvania Dutch called drechter kucha (a Pennsylvania pronunciation of trichter) and “funnel cake.” An early printed record of the term “funnel cake” was in Pennsylvania German Manual by A. R. Horne (Allentown, PA, 1875) in the Pennsylvania German Dictionary section as the translation of drechd’rkucha. 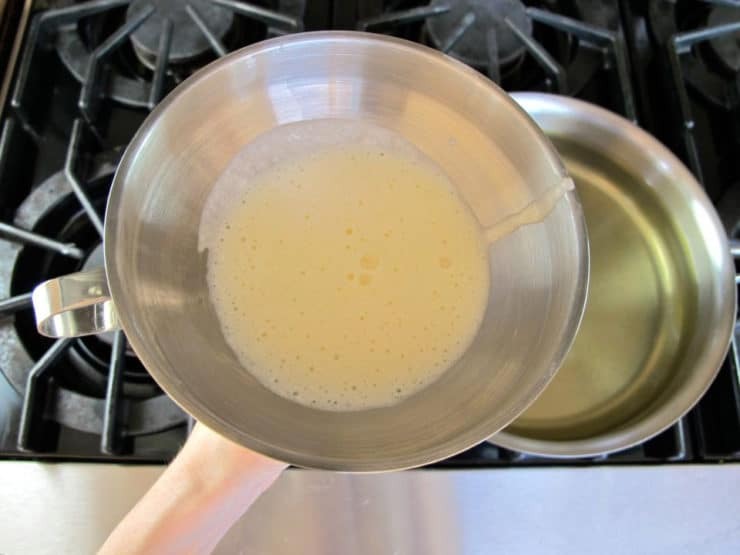 Slowly heat 1 ½ inches of lard or vegetable oil in a sauté pan or deep fryer to 375 degrees F. While the lard or oil is warming, beat the egg yolks until lemon color and frothy. Sift together 3 cups of the flour, the baking powder and the salt. 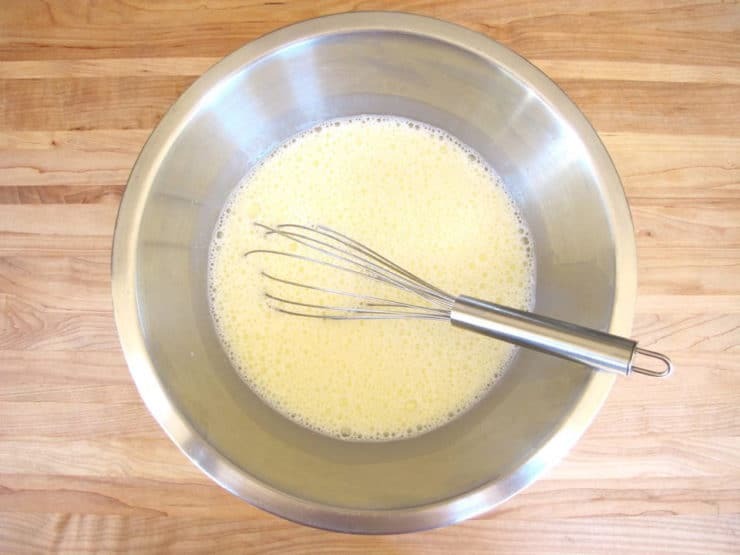 Sift this into the milk and egg mixture and beat to form a batter. 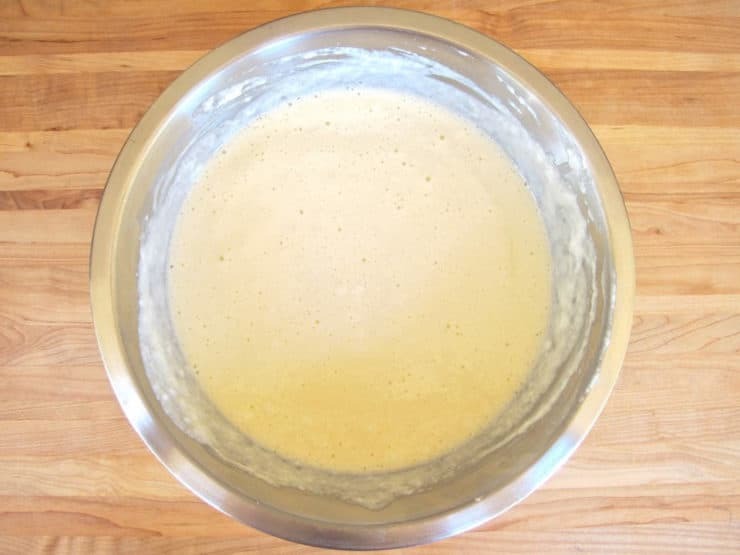 The batter should be similar in texture to a thick pancake batter. If the batter seems too thin, add some of the remaining flour until thick. I ended up adding about 4 cups of flour total. 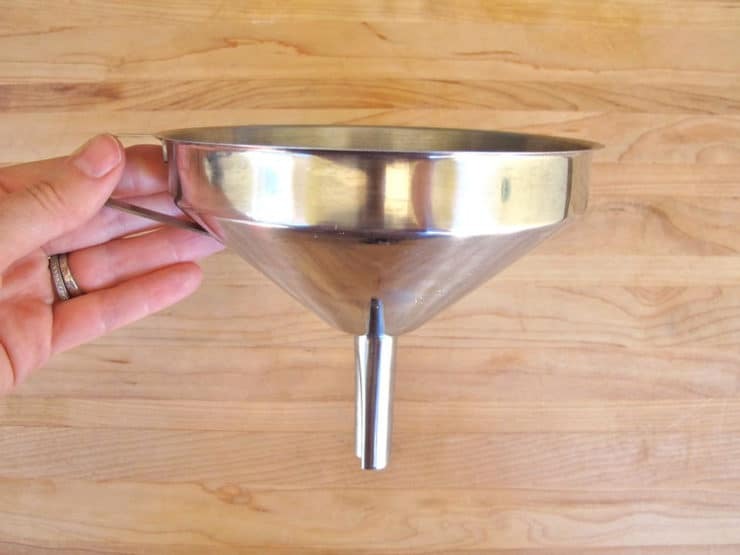 You will need a funnel with a 1/2 inch opening on the spout to control the flow of your batter. Take about ½ cup of batter and pour it into your funnel, stopping the funnel hole with your finger till you're ready to pour. 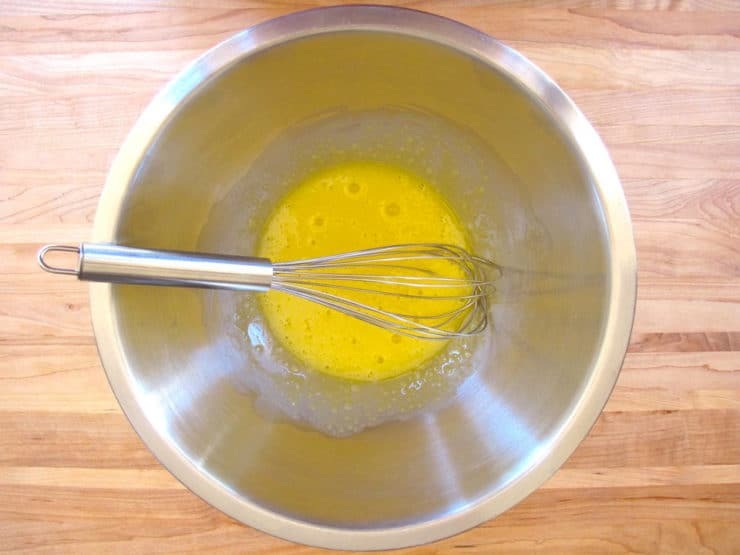 Drizzle the batter into the preheated oil, starting at the center and rapidly moving in circles in an outward motion; this will create “coils” of cake. Work quickly, since the cakes take only a minute or two to cook. 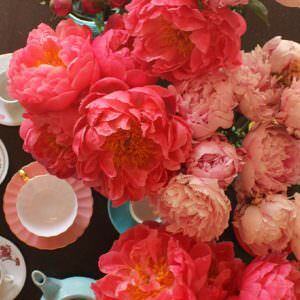 You can become as creative as you like and make all sorts of exotic shapes once you learn to master the funnel. Flip the cake delicately using tongs or a slotted spoon/spatula. Continue to fry till golden brown. Once the cakes turn crispy and golden, lift them out with a slotted spoon and drain on a rack or paper towels. 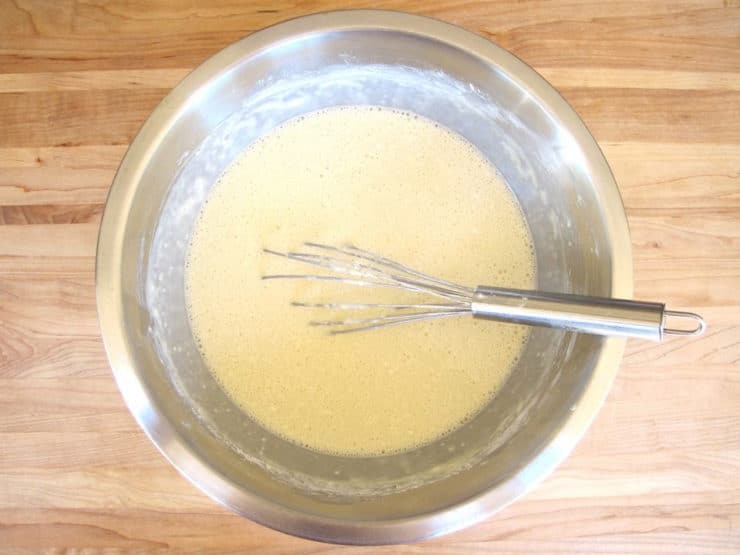 Continue filling the funnel and frying cakes in this manner until all the batter is used up. Cook the cakes one at a time, otherwise the batter will lower the temperature of the oil and turn the cakes soggy. Dust with confectioners’ sugar and serve. 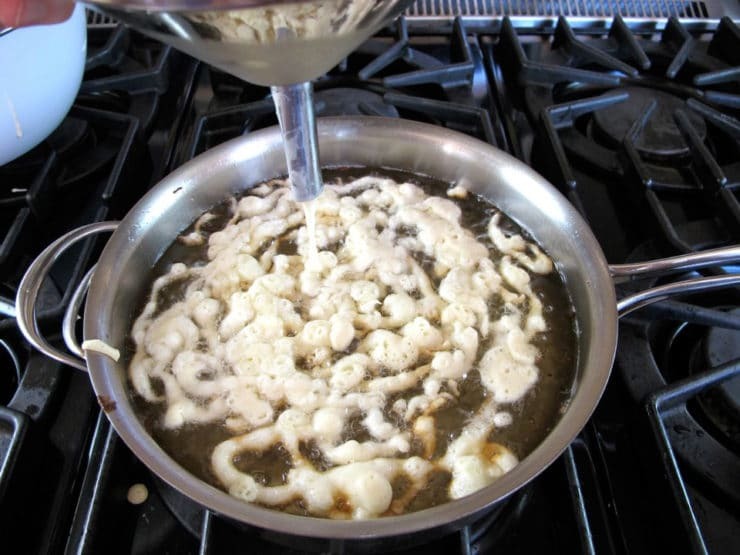 Kosher/Vegetarian note: use a vegetable-based oil with a high smoke point for frying, like grapeseed or peanut oil. Adamson, Melitta Weiss (2002). Regional Cuisines of Medieval Europe: A Collection of Essays. Routledge, US. The Forme of Cury: A Roll of Ancient Cookery Compiled, about 1390 A.D. Project Gutenberg EBook, n.d. Web. 04 June 2013. Hieatt, Constance B. and Robin F. Jones (1986). Two Anglo-Norman Culinary Collections Edited from British Library Manuscripts. Medieval Academy of America. US. Richman, Irwin (2004). The Pennsylvania Dutch Country. Arcadia Publishing, UK. Weaver, William Woys (2013). As American as Shoofly Pie: The Foodlore and Fakelore of Pennsylvania Dutch Cuisine. University of Pennsylvania Press, US. Wonderful, informative site. 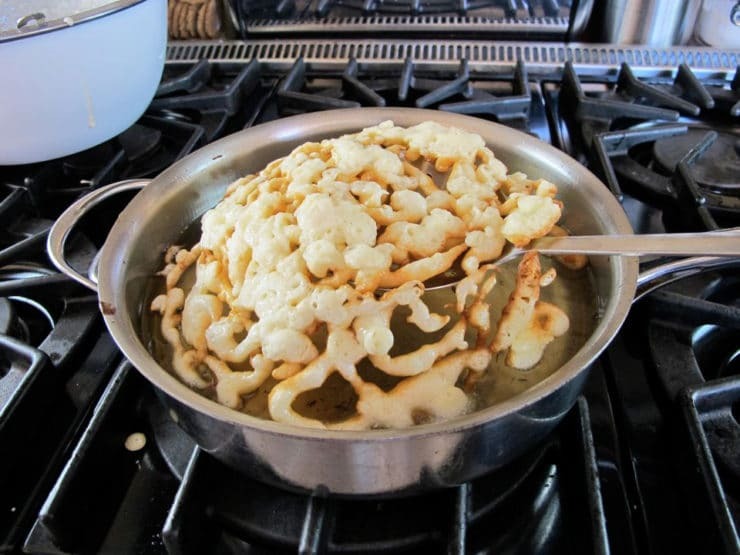 Saw a program on Carnival Eats yesterday and so many of the recipes had a batter that was described as similar to funnel cake and pancake batter….a cross between the two….so I had to go investigating. I love history, accurate history and this was the perfect place. I am trying these today just as the recipe calls for and then I am going to try and Fluffer- Peanut Butter- Bread-Banana- Battered fried treat that I saw on the show yesterday. Thanks so much for the recipe and the history lesson. Made these yesterday and they were wonderful. Tender & crispy at the same time. 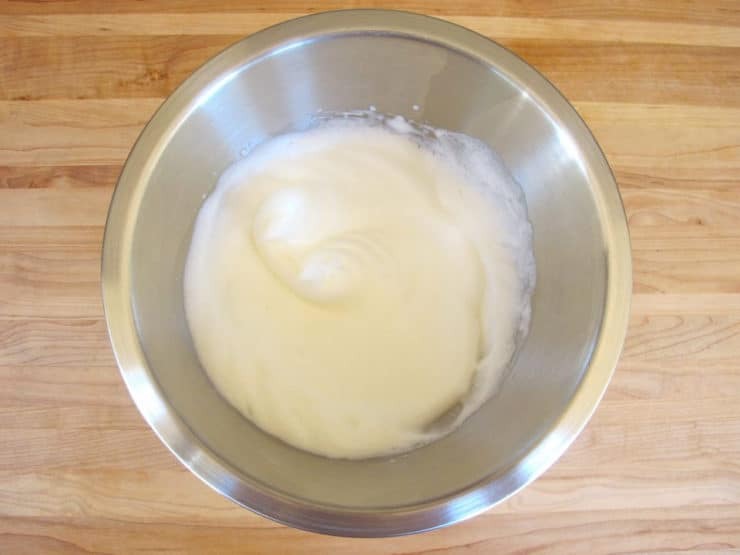 I did have to make sure that the initial batter was thin enough, so that after folding in the egg whites, it would run easily thru’ the funnel tool. The two that were left over, heated up nice & crisp in the oven this morning. Placed them in a cold oven, heated it to 350 and left them there till they felt crispy……somewhere between 3 and 5 minutes. Thanks for a great recipe! 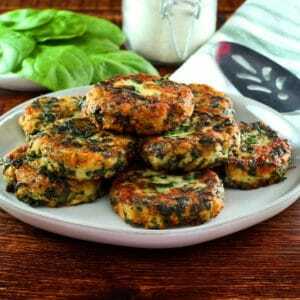 I tried this recipe for my family absolutely fantastic!!!! It was gone in seconds!!! In the Portuguese tradition, these are called “Farturas”, which my Spaniard brothers call “Churros”. Same old, same old. The same exact recipe! Enjoy! (Not too frequently, though. You all know about fried foods). Yum! I’ve made funnel cakes before, but this trick of separating the eggs and beating the whites before adding them should make them turn out better than my previous try. Thanks! I like to use refined coconut oil for deep-frying. As a saturated fat, it is very stable. 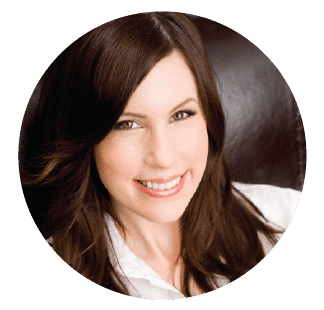 I came across “Shiksa in the Kitchen” when searching for a recipe for mint-infused simple syrup, and I’m so glad that I discovered both of your interesting blogs! Tried this today, perfection! Called it dribble cake. Added cinnamon and vanilla and it was fast and easy! Yummers! Took a pic if you ever need it.